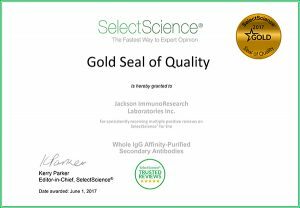 The Gold Seal of Quality has been awarded to Jackson ImmunoResearch Laboratories Inc. for consistently receiving multiple positive reviews on SelectScience® for our Affinity-Purified Secondary Antibodies. In these busy modern times reviews are precious. Embarking on a new experiment can be daunting. New techniques using new equipment and reagents often require careful optimization and validation before the collection of usable results. In the race to publish, methods which shortcut to publication are desirable. To expediate experimental optimization it’s common practice to ask for advice from trusted colleagues. Their experience can avoid common technical pitfalls and improve experimental design. Alongside input from colleagues, products referenced from materials and methods sections within peer reviewed articles can offer insight into a products suitability. Manufacturers can also offer technical support. The product review offers the researcher and opportunity to observe the product in the hands of another researcher in a comparable assay. This can increase the level of trust in a product, and can help to differentiate products, enabling you to choose the correct product for your experiment. SelectScience collects online peer-to-peer information and product reviews with the aim of informing scientists about the best products and applications. SelectScience aims to promote scientists and their work, with the intention of accelerating the communication of successful science. They aim to achive this by allowing scientists to make better decisions through having access to independent, expert information and easy access to manufacturers They use editorial features, event coverage, video and webinar programs to inform the global science community about relevant products. Product excellence is highlighted using award schemes such as the quality seals which qualifies products receiving exemplary reviews. What warrants a gold seal? A SelectScience seal of quality recognizes products that have consistently received multiple positive reviews on the SelectScience platform and are designed to assist scientists in making purchasing decisions. A seal of quality is assigned to approximately 0.1 % of products on the SelectScience website and are allocated in line with strict criteria based on the quantity of reviews a product has received and the average rating of those reviews. 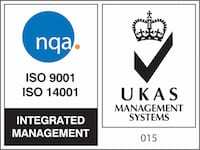 The gold quality seal is awarded for products that receive a minimum 100 reviews of over 4.5 stars out of a maximum 5. Jackson ImmunoResearch affinity purified secondary antibodies are such products.